Rise & Shine... It's Time to Play! Kids of all ages get ready to bounce, dance and sing-a-long to jazz, blues, and pop-rock songs with a positive message the whole family will enjoy over and over. Jennifer started her music career at 3-years old, singing on stage for her big sister’s Kindergarten graduation, and now after years of establishing a professional music career and after many musical adventures, she is back to singing a jazzy version of “The Ten Little Indians” for children of all ages nationwide. Jennifer was raised in South Florida calling Palm Beach Gardens her hometown. From very young, she was known in school and church for performing on stage as a featured soloist or member of several active choral and musical theater groups. While in college, Jennifer continued to pursue music. She performed for two years with the 16-member Chamber Singers. They toured the state of Florida, and in the Spring of 1996, as the featured soloist, Jennifer and the Chamber Singers toured France. She also won a Country music competition for one of the local radio stations, as well as performed Friday nights as the regular Jazz entertainment at the Heritage Country Club. After school, she and her identical twin sister, Patty, traveled and toured the United States with their pop-rock band, “Stirling”, including performances at the Elbow Room in New York City, The Roxy in Los Angeles, and the Hard Rock Café in Atlanta. They released a self-titled album with all original songs in 1998. Then… Jennifer became a Mom – her biggest adventure yet! Her tremendous love for her children and her passion for music took her music career in a new direction as of 2003 with daily inspiration from her two boys. “Every day is a new song,” says Jennifer. Jennifer is now known as a National Jazz Family Entertainer. “I wanted to write songs that both kids and grown-ups could enjoy… over and over,” says Jennifer. 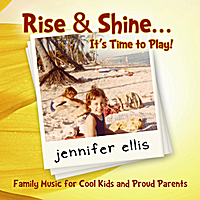 Her new album, “Rise & Shine… It’s Time to Play”, includes educational songs with positive lyrics that inspire core values such as independence for example in the lyrics of “All by Myself” and “It’s Bath Time”, family values like “I am loved” and “I’m Proud of You”, as well as having fun like “Everybody Bounce” and “Play Ball”. Jennifer’s full band of talented musicians, also featured on the album, include Bobby Sharp on drums, Dan Karlsberg on organ/keyboard, and Dave Ridenour on the acoustic/electric guitar.